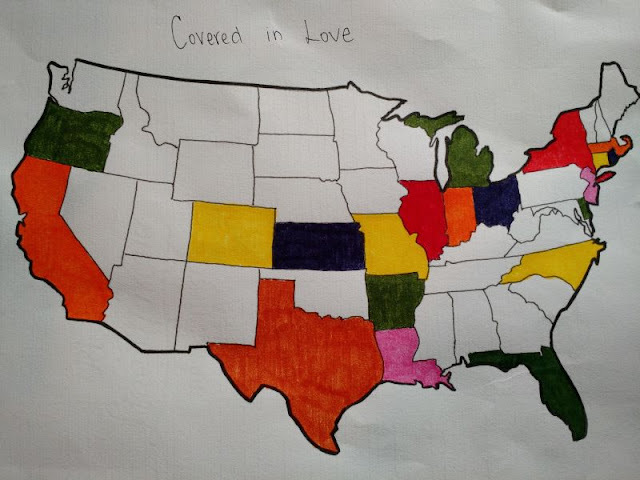 There are a lot of people who contribute to help make Covered in Love happen. Like, a lot. Well over a hundred have participated and about 50 of you are active on a regular basis. I take as many photos as I can and generally any quilt that I finish will show up in a Friday post. Sometimes, though, I get really lucky and folks send in quilts already finished, so all I have to do is add a label! I'll be honest, those are my favorite boxes to open, and ironically, they're the ones that tend to fall through the cracks and never make it onto the blog! 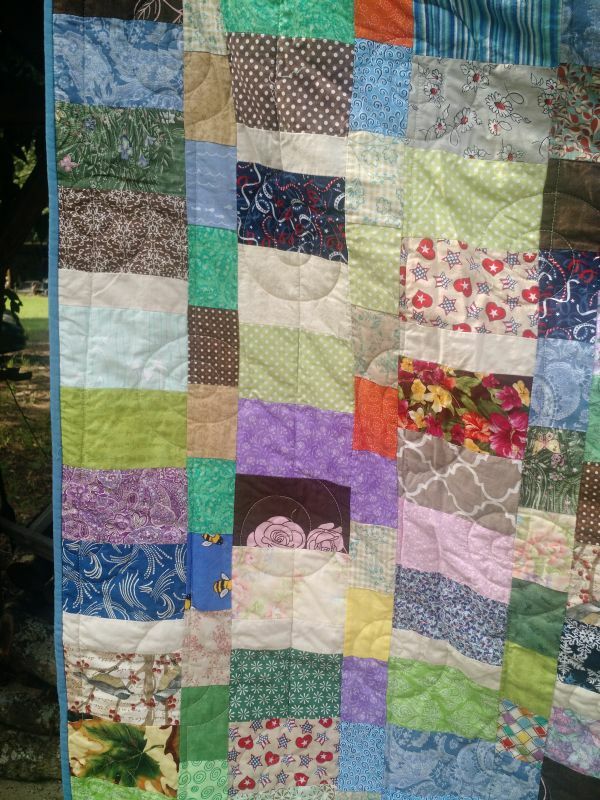 So this week is all about celebrating some of CiL's unsung heroes and three quilts that came is already done. 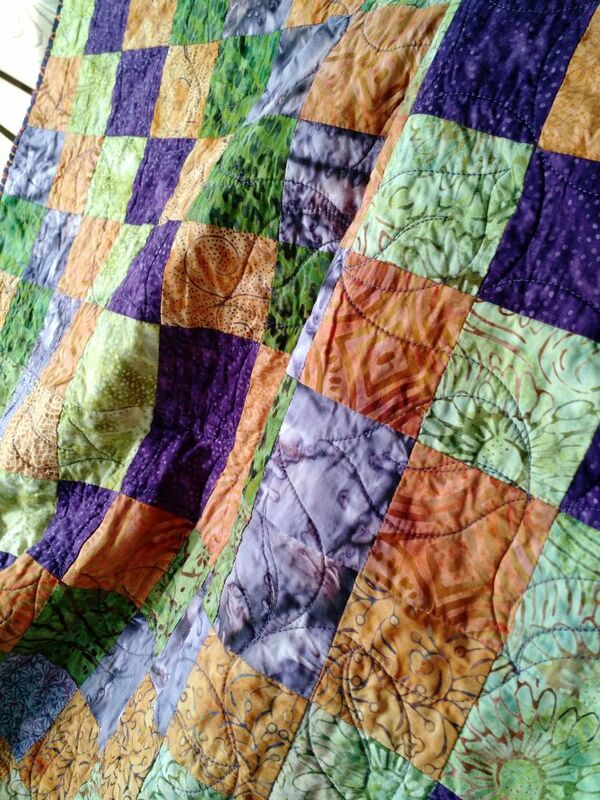 First up is Sue from Washington who sent in this beautiful, large batik quilt. The design looks like Bonnie Hunter's Trips Around the World block and those batiks are so pretty! 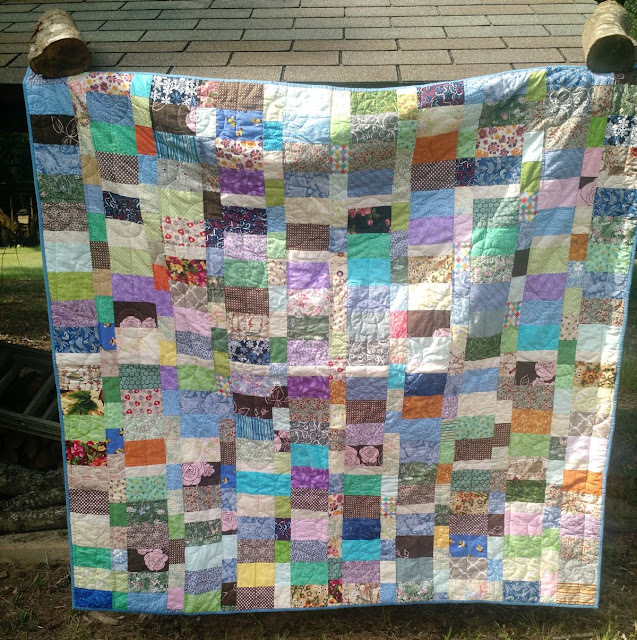 Sue said the quilt was pieced by her and quilted by her son, who is a professional long-armer. Don't we all wish we had one of those in the family! He did a great job with a design of diagonal leaves and diamonds (easier to see from the back). Thank you both, someone is going to treasure this quilt! Next up are two bonus quilts Cynthia included with the color-block quilts she finished for the block drive. This one was a top Johanna from North Carolina sent to Cynthia and she quilted it. Johanna has sent in many tops over the past several years. You can see I was fighting less-than-ideal light conditions the day I took these, but I was in a rush because I needed to drop them off at the hospital that afternoon! 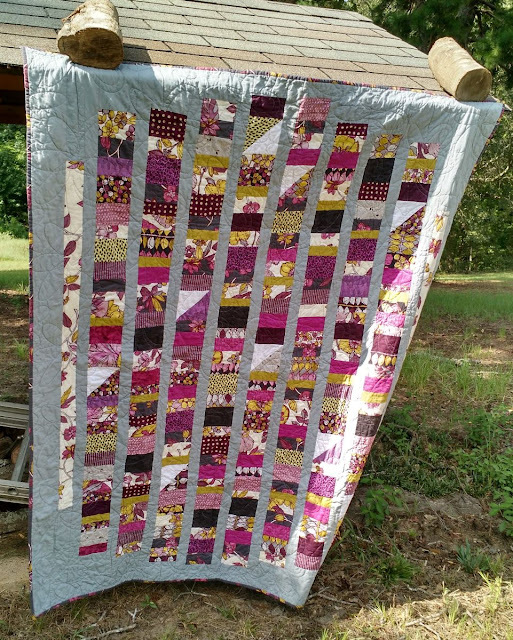 This quilt was another one of Cynthia's and I love it. 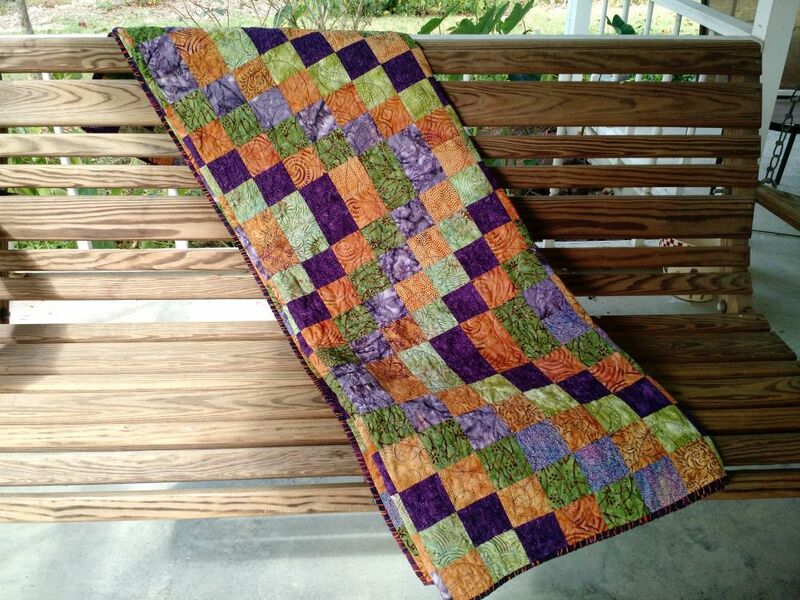 The purple-green-grey color combination is so unexpected, but perfect. I love the stacked coins setting for scraps. 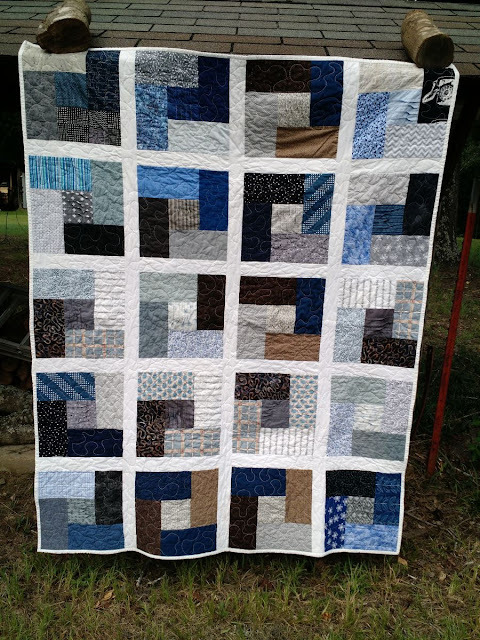 Cynthia also sent me another quilt which I either failed to photograph or lost the images of (I told you they fall through the bloggy-cracks!). 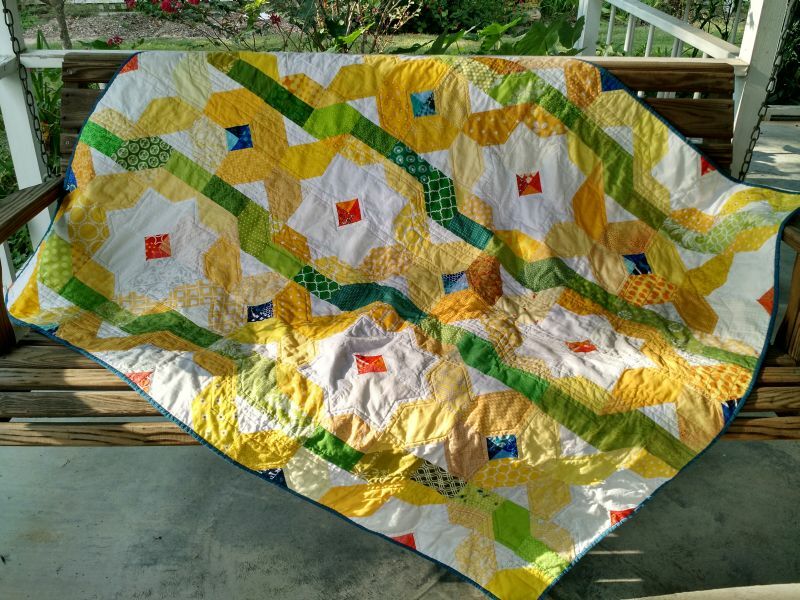 You can see her post here about the scrappy green quilt she sent. 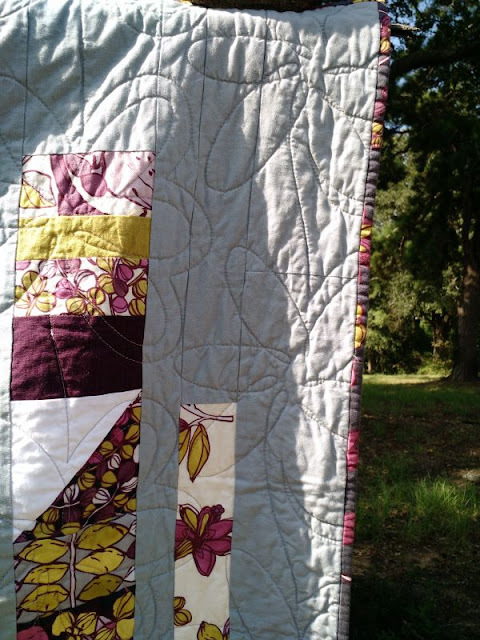 Cynthia is a long-armer and the oversized flower design she did on this quilt is one of my favorites ever. 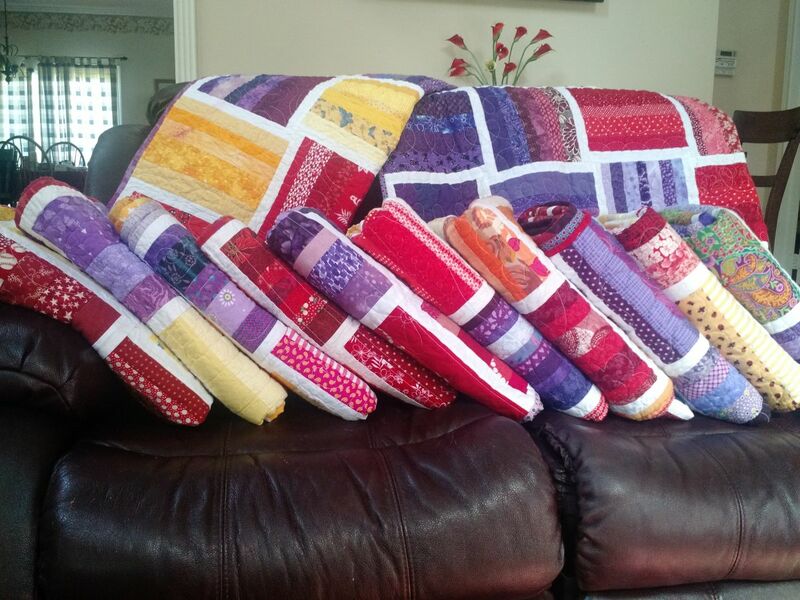 Sandra from Alabama and Louise from Florida have also recently sent in finished quilts which I didn't take photos of. Thank you to ALL the unsung heroes who keep CiL in quilts! If you'd like to join in with Covered in Love's mission you can learn more on the main page or check out the block drive. 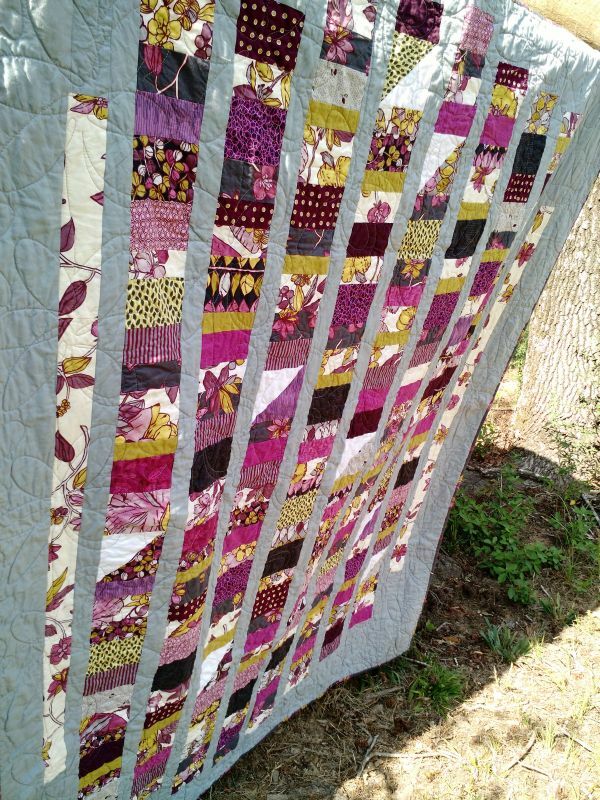 The current Covered in Love block drive is a simple Fall-colored patchwork. This drive will run until the end of October if you want to help out. More info here! *By the way, thanks for all the well-wishes last week on my eye surgery. I am doing much better, still just a little blurry. The worst part by far was being bored to death for several days because I could not see well enough to read, sew, or drive! Before my eye surgery last week I got September's do. Good Stitches block sewn up. 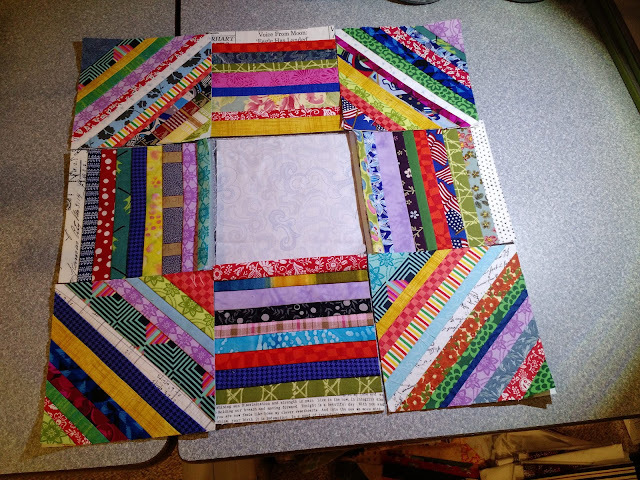 Briawna asked for these fun string pieced blocks. If you've ever thought about joining up with do. Good Stitches I know several circles, including mine, are in need of new members. It's a lot of fun and I highly recommend it! No finish for Covered in Love this week, I've been too busy getting ahead on everything so I can do nothing but sleep in a dark room over the weekend. I'm finally having surgery to correct my lousy vision (not LASIK, but something similar called PRK). I've worn either contacts of glasses since I was about 12 and my vision without them is terrible, way beyond legally blind. I'm excited about the procedure, of course. Well, not so much the procedure as the results of it. There aren't many advantages to being this nearsighted, but I admit there is one thing I'll miss. 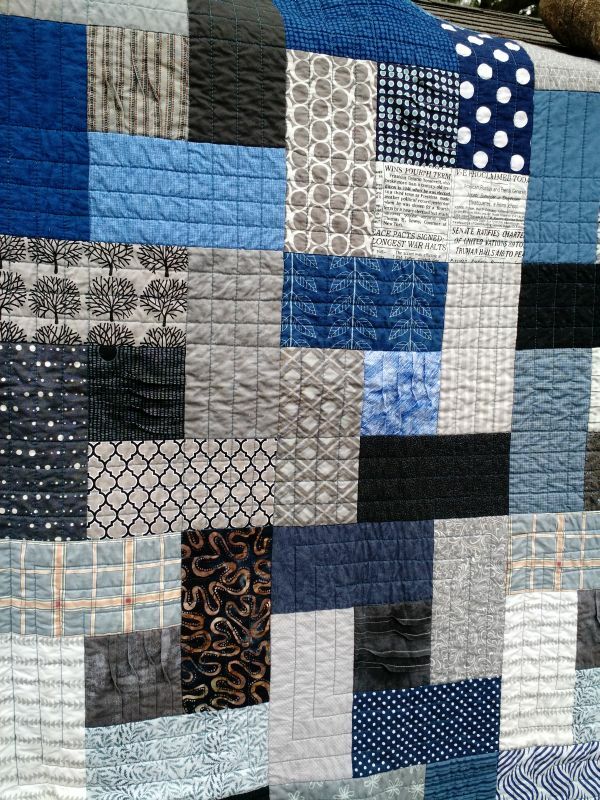 Since I started quilting I've enjoyed being able to take my glasses on and off as I arrange things on the design wall. Take the flying geese above, for instance. This is a pretty rough layout, just for me to get the idea. I was going for Dutchman's Puzzle blocks set on point. It's not obvious, but I've got my geese oriented wrong. Check out the image below. See how the correct blocks jump out at you right away? And the color problems are much more obvious, too. I've heard of people using photoshop to manipulate photos of their design wall to look for color/pattern issues, meanwhile I've been able to just pop my glasses off and check things out. Anyway, obviously it's a small price to pay to not having to wear glasses or contacts any more and I hope by mid next week I'll be back and better than ever! 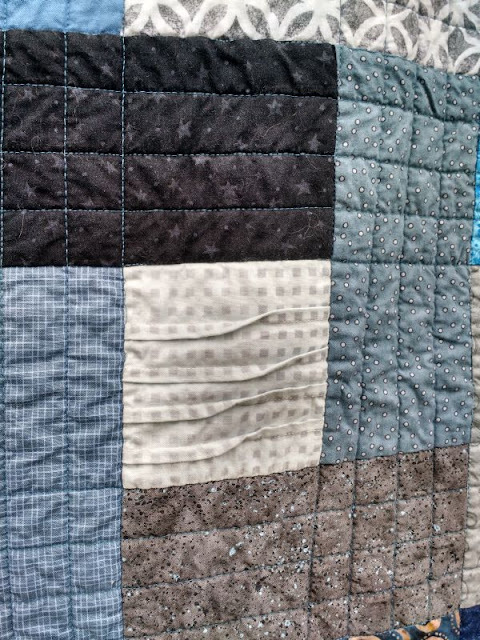 This week I fired up my quilting machine again for the first time since May. So good to get back to it! 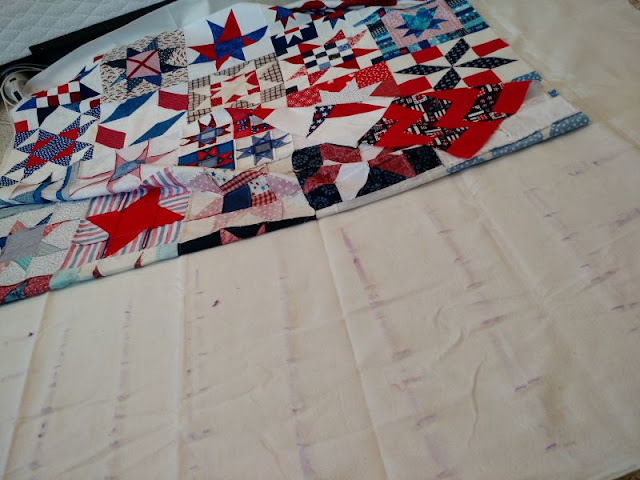 I quilted one of the Red White and Blue Stars block drive quilts and photographed the process for a tutorial about how I baste quilts using glue sticks. See those cute little penguins in the block above? The star quilts are coming together and I can't wait to have the whole bunch all finished! I use plain old Elmer's glue sticks to baste. I like the purple kind because it lets me see my glue lines. These are the extra large sticks, they usually cost a dollar and one will do about 1.5 large quilts. Despite not changing my needle nearly as frequently as I should (you know we all do it) I have had NO issues with the glue gumming up the needle. If any of it is being transferred to the needle it's not noticeable at all. Start by spreading out your batting on the floor (or any flat surface, I used to do it across the bed, and you will only do a section at a time). 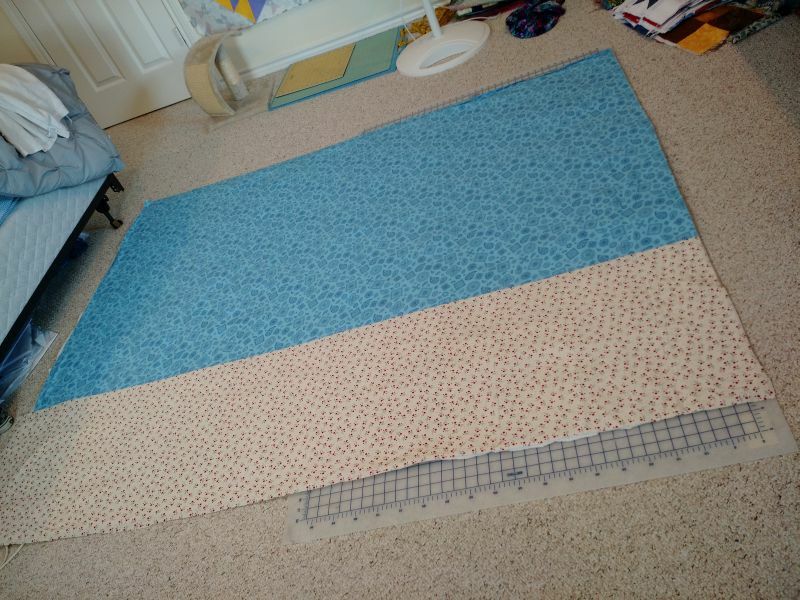 Having something stiff underneath like a large cutting mat does help. Spread out the top and make sure the batting is big enough. Fold back about 18" -24" of the top edge (where you had it most precisely aligned) and quickly apply lines of glue about every 6". 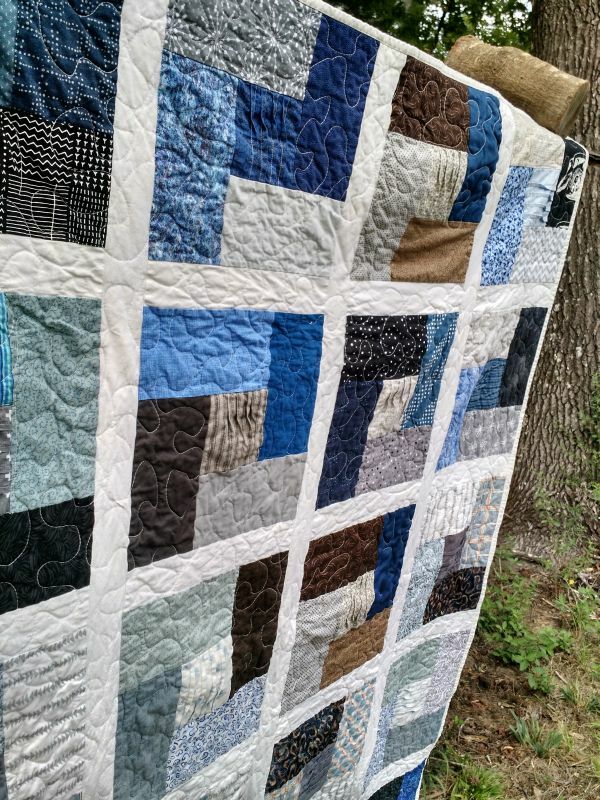 Obviously this wouldn't work with high loft batting, but with something like Warm and Natural, or this Quilter's Dream blend the batting doesn't try to warp or stretch. Pull the folded up section of top back over the glued area and press firmly with your hands starting from the center. Then fold up the longer, loose part of the top onto the part you just glued down. Again, apply glue to a section about 18-24" long, pull the folded top back into place and press smooth. I find it easiest to smooth and press the newly glued sections from on top of the quilt. The working time with the glue is similar to with spray baste: not a whole lot, but enough. Once the newly-glued part is stuck fold back the loose edge again and repeat. Keep this up until you've got the whole top attached. If you are working on a small surface (like a table or cutting mat) you can fold the finished part and pull the new up as you go. Once the top is attached I usually trim my batting to within a couple inches of the top. Flip the top-batting sandwich over and repeat the exact same process, starting with lining up the backing to make sure it's big enough. 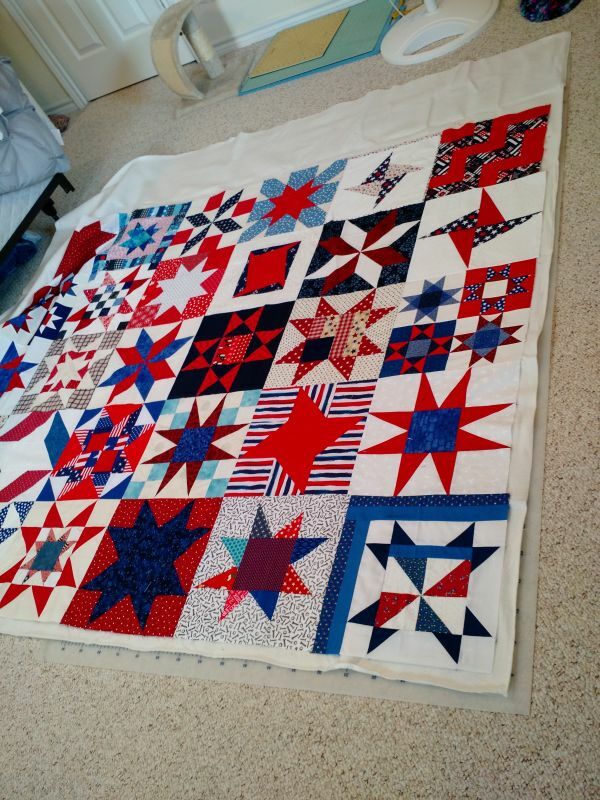 Next step: quilting. 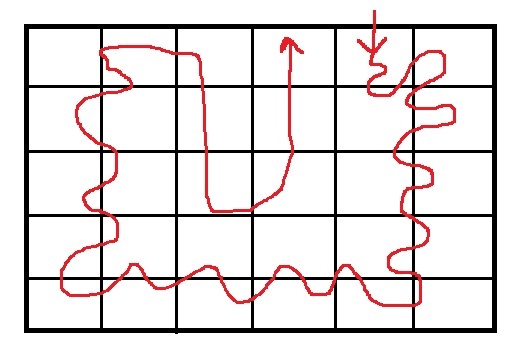 The diagram above is a (very) rough depiction of the approach I take to quilting on my domestic machine. 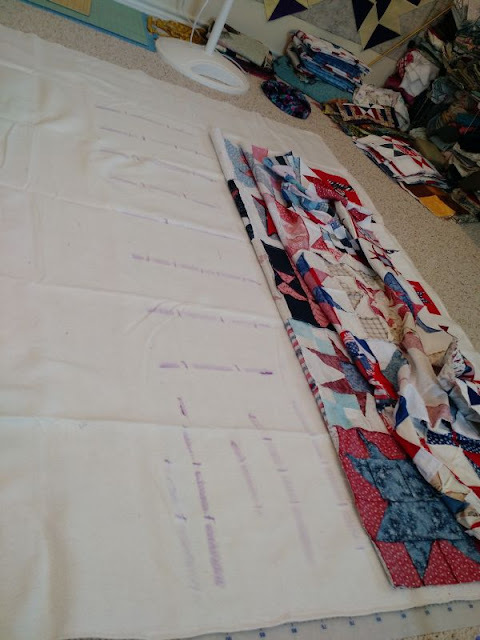 Basically I start about 20" from the bottom of a long side, I work across the adjacent short side covering the outer (about) 20" of the quilt, turn the corner and go up the other long side, then down the other short side, then fill in whatever remains. Often I use the quilt blocks as a guide. This method keep me from accidentally skipping any areas and minimizes the bulk going through the throat of the machine at any given time. 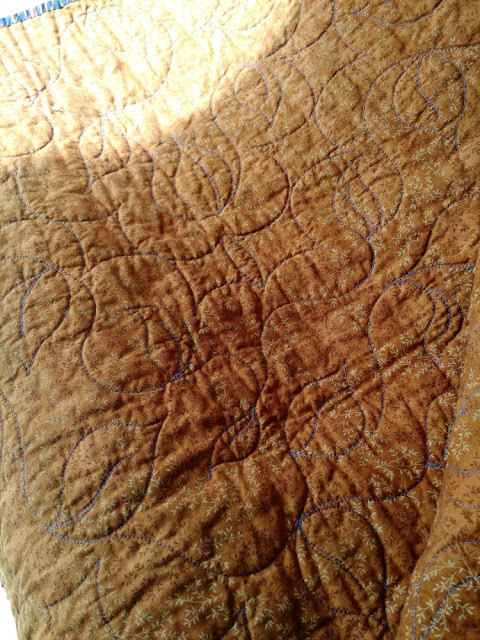 My mid-arm quilting machine is one of those temperamental divas that only like certain kinds of thread. 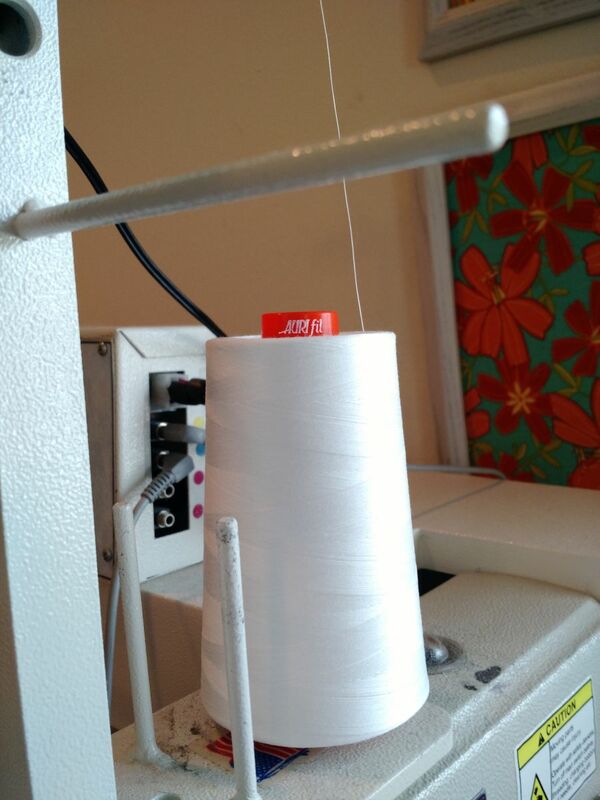 Aurifil was recently kind enough to send TWO big cones of thread for Covered in Love. Note, this is not a sponsored post, they sent me thread without asking for anything in return and I just really want to say THANKS! This kind of glue basting is obviously not for everyone, or for every quilt. You can't do this on a quilt that won't be washable. 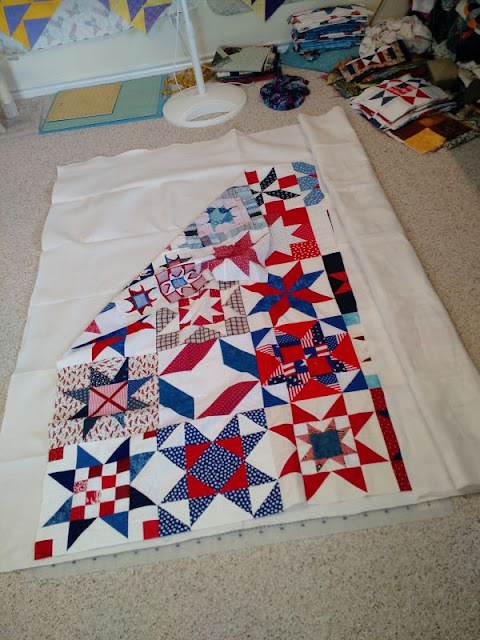 I don't think it would work for walking foot quilting or for very tight FMQ; the fabric isn't stretched taut enough and wrinkles would be inevitable. 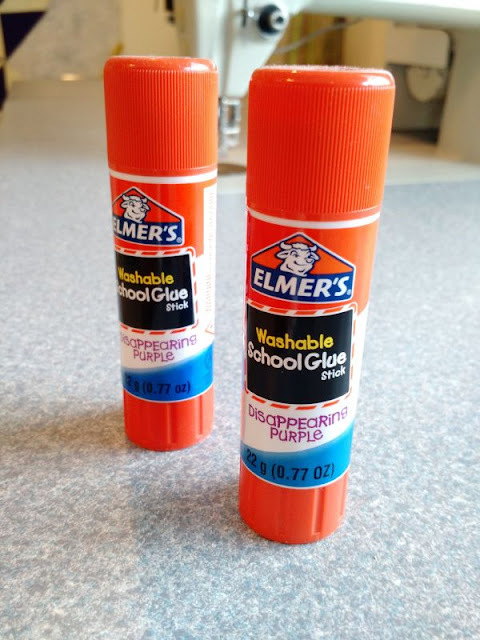 I have seen techniques using thinned out bottled Elmer's glue to paint the entire surface of the batting, and I imagine that might work since every square inch is covered. For me I find that the amount of shifting/wrinkling I get with this is very similar to what I had with pin basting. For a loose, free motioned stipple it works perfectly! For reference, this is my typical stipple density. That is a 12" block, and I have small hands. After quilting I finish my quilts as usual and then toss them in the wash. I don't have to use extra soap or hot water or anything to get the glue out, it comes out fine. You can tell it's all gone once the rinse water is clear instead of purple. I hope this helps take some of the pain out of basting for you! If you have any questions please comment and I will do my best to answer them. It's another block drive wrap up this week! This time from the March/April "grandad's shirts" blocks. 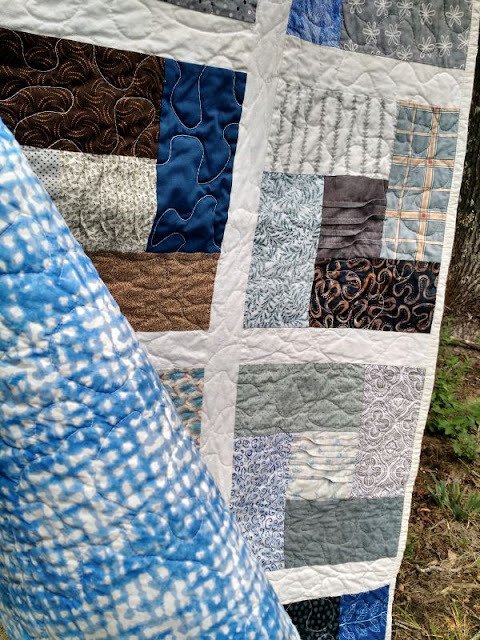 Soothing, masculine colors with subtle texture and great scrappy fabric variation make these quilts soooo cozy. First up are two quilts (above and below) quilted by Judy from AZ. She used geometric designs and grid quilting to emphasize the right angles in the blocks. 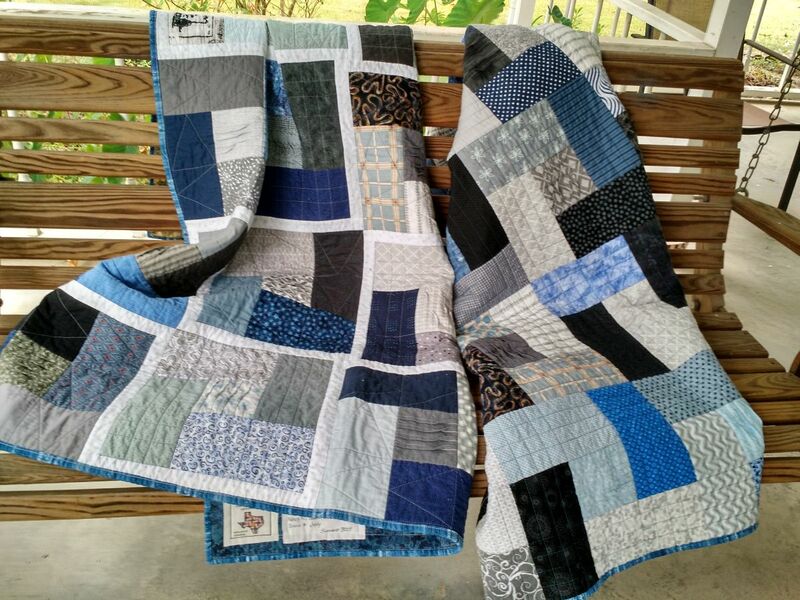 The next two quilts, below, were assembled and quilted by Kathy from Texas. 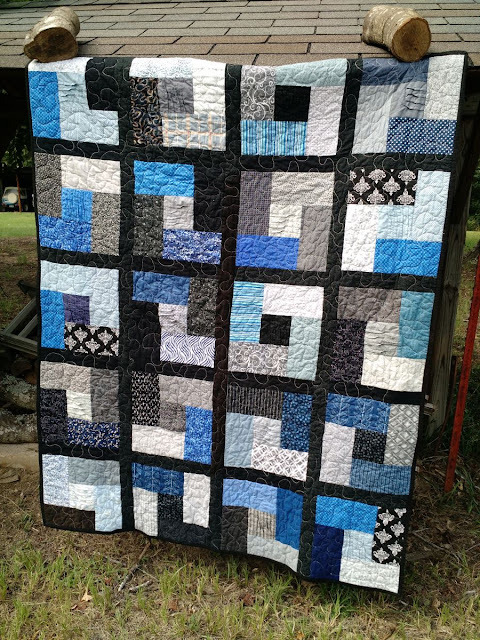 Kathy used stipple quilting, which gives the quilts a completely different feel and brings out the scrappiness of the all the different blocks. Twenty three quilters contributed to make these four quilts. Thanks to all of you who were brave enough to tackle nested seams and pleats for this blocks drive! These blocks were inspired by the colors and textures on the button down shirts I remember my grandad used to wear. (Hence I called the block "grandad's shirt"). 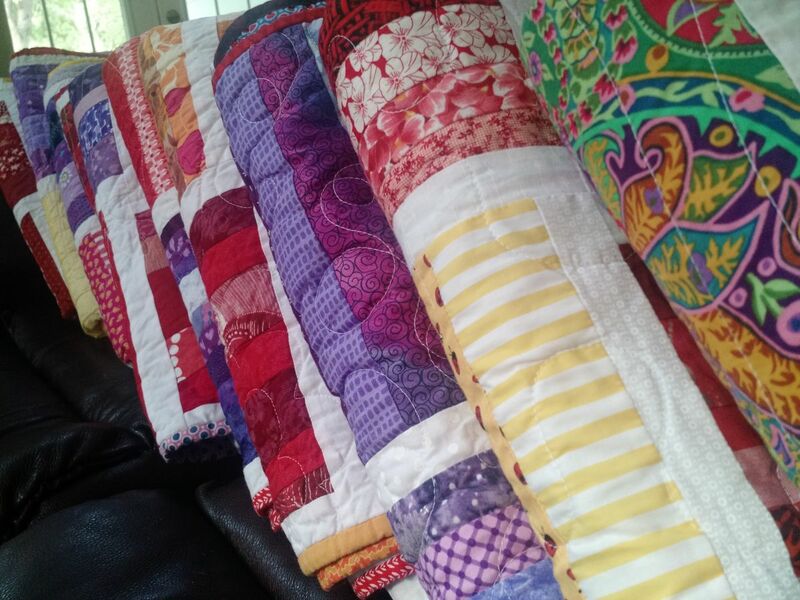 I hope the families who receive these four quilts will also find comforting memories attached to the fabrics. For sure, there's love in every stitch! Covered in Love recently surpassed 220 quilts passed out to dying patients in the hospital and I could never have done it without help from so many of you. 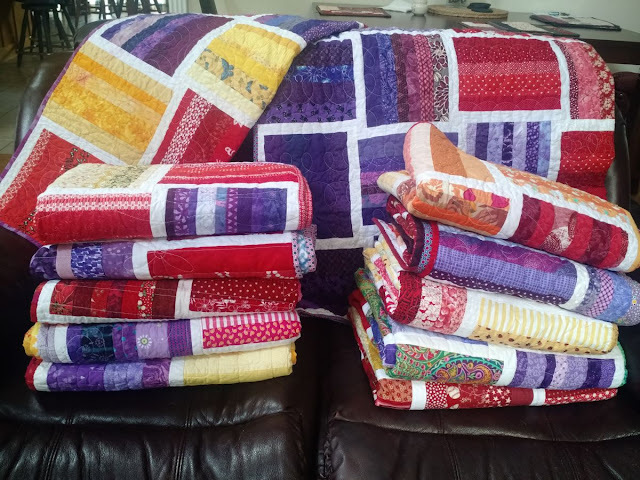 Big thanks to Kathy, Judy, and the twenty ladies who sent in blocks. You all rock! If you'd like to join in with Covered in Love's mission you can learn more on the main page or check out the block drive. 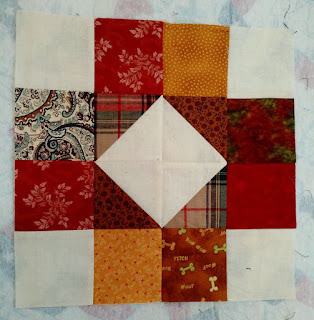 The current Covered in Love block drive just began and it's a simple Fall-colored patchwork. This drive will run until the end of October if you want to help out. More info here! The NURTURE circle (do. 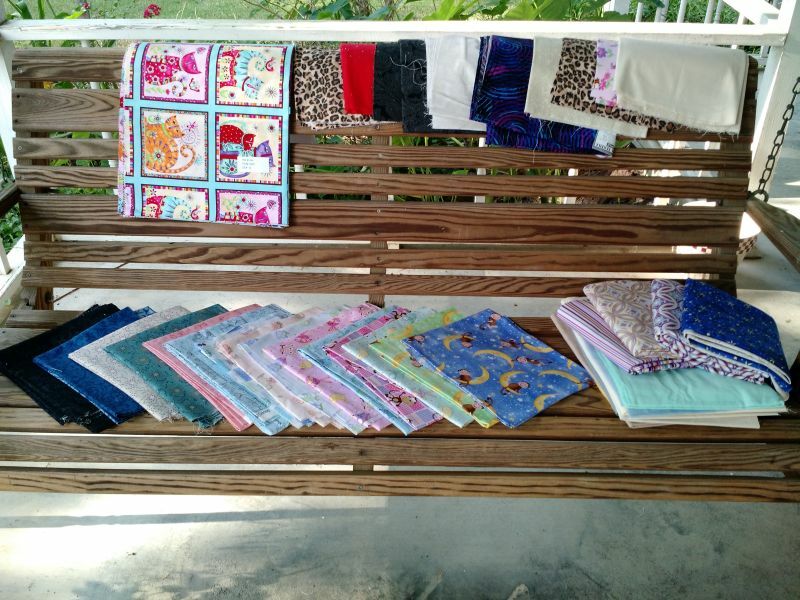 Good Stitches) quilters have been busy lately and the quilts have been coming in! 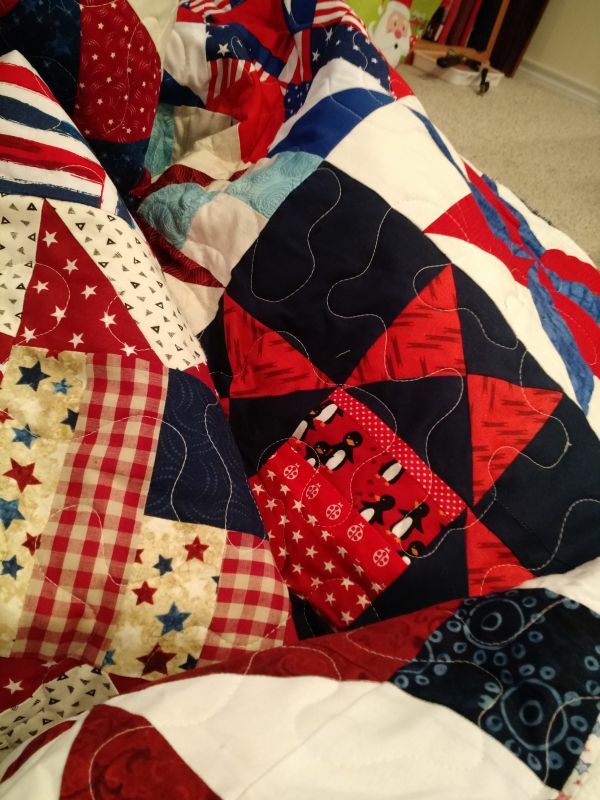 I posted two quilts just a couple weeks ago and now have two more. 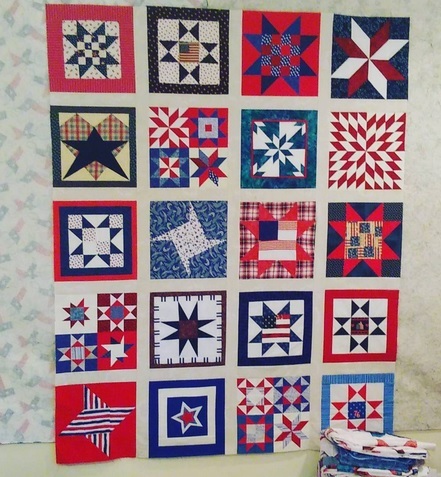 This cool scrappy star quilt was assembled and quilted by Kat C. and she did a great job. I love the colors she chose! The pattern is the Casual Link block from Twiggy and Opal. Another version of this quilt might be in my future; I have wanted to make 8-pointed stars for a while. 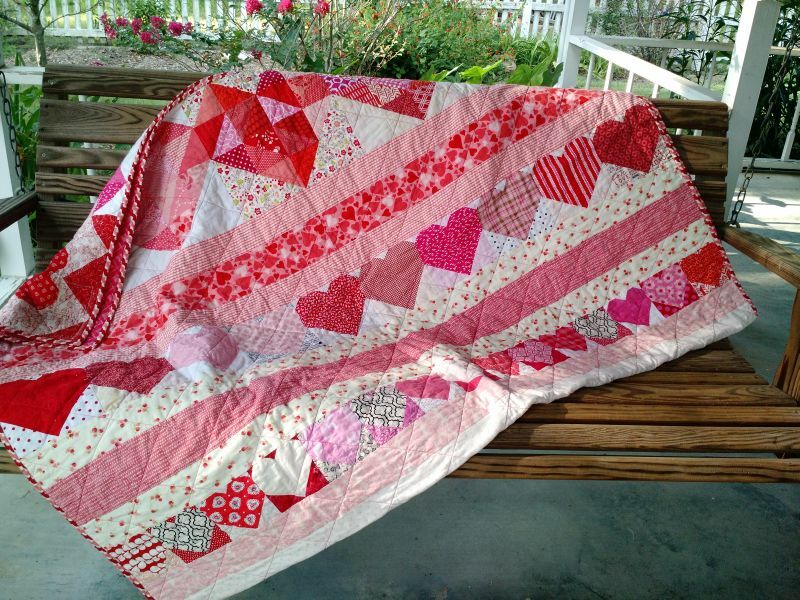 This pretty pink quilt was assembled and quilted by Dhia, she asked for a variety of heart blocks from us and did a brilliant job assembling them into this large quilt ready to wrap someone in love! 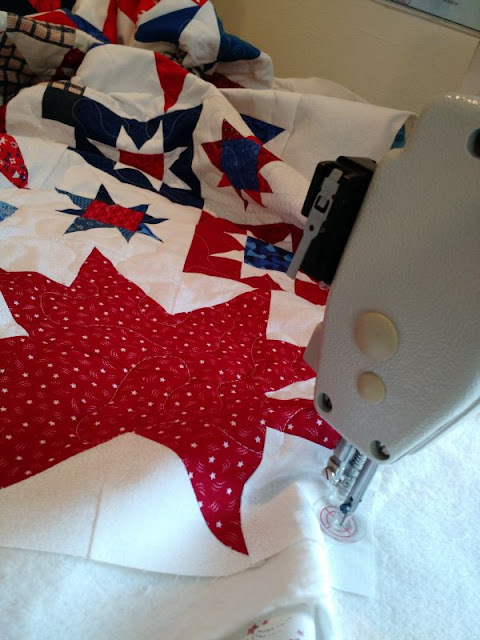 If you've sewn anything for charity recently please link up below. It's a great big block drive finish this week! Back in May/June I asked for string color blocks for the Covered in Love block drive. Cynthia from Quilting is More Fun Than Housework volunteered be a guest-host of the block drive and assembled and quilted the blocks. 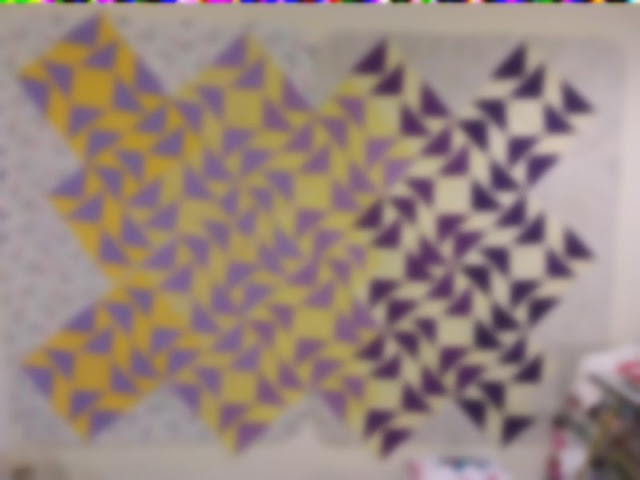 For closeups of each quilt and more details on the process you can read Cynthia's posts about the quilts. 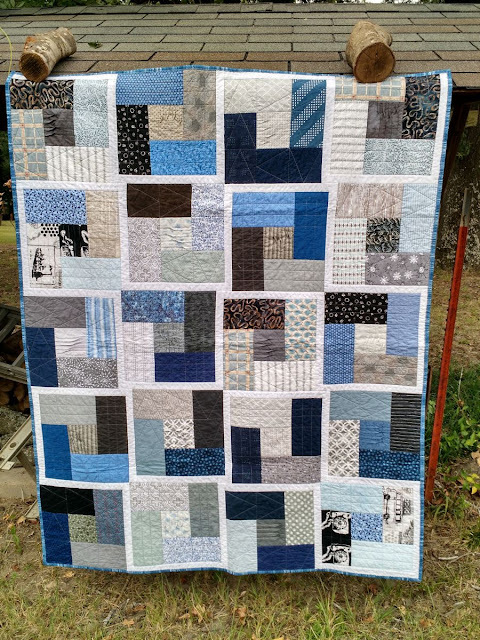 If you haven't seen her posts you really should go check them out, she did a great job being creative with block layouts. In all there were a dozen 50"x70" quilts made from this block drive! "Your readers are so supportive and generous. It was so much fun to see the beautiful blocks that filled my mailbox every day. For me, it was especially entertaining to see the fabrics that were used - talk about having Scrap envy! 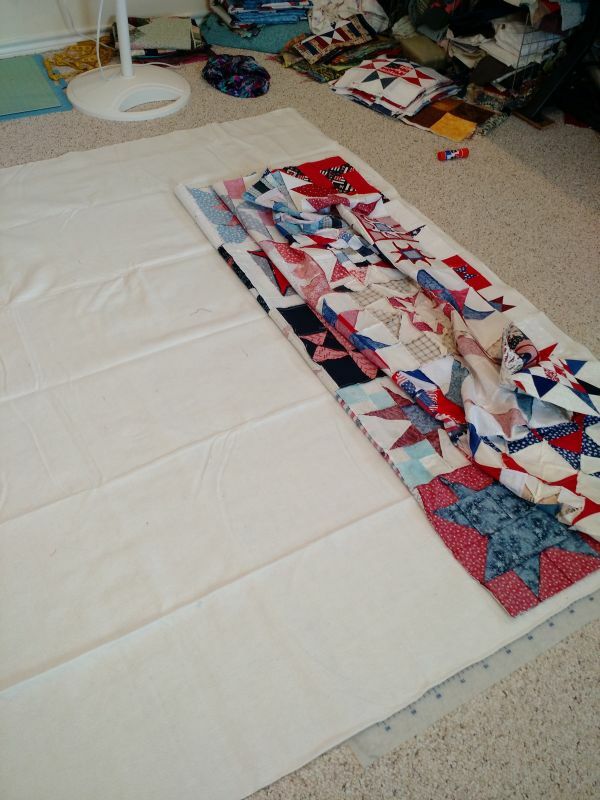 I was also amazed at how quickly the quilt tops all came together thanks to the lovely workmanship on the blocks. My studio was awash in all those bright colors!" One neat thing Cynthia did which I think I will continue was to color in a map of the US with where blocks were received from. It's very cool to see where blocks came from, and already folks in some of the un-colored states have been inspired to join a block drive and get their state on the map! 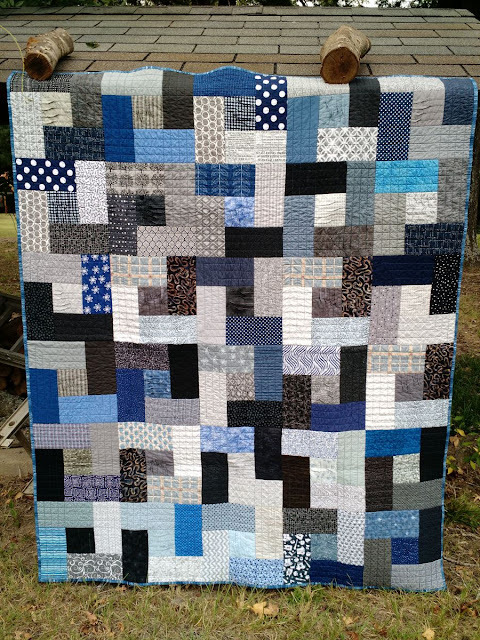 The cool block tutorial from this drive was one of Cynthia's Scrap-a-Plaooza Quilt Tutorials series. She has LOTS of great blocks for using up scraps and her tutorials are always top-notch. Thanks to Cynthia and to each and every one of you who made an incredible twelve quilts possible! Happy Hump-Day everybody! Hopefully most of you are enjoying a shortened work week. 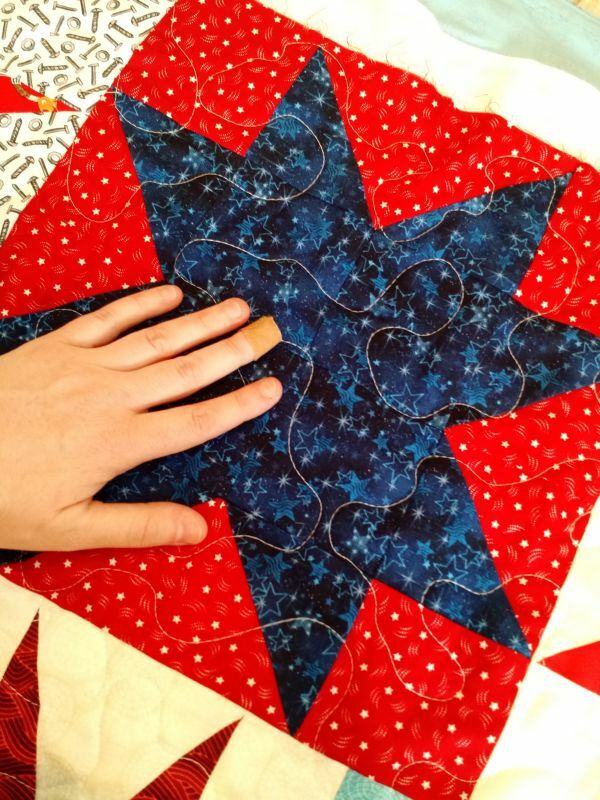 I have been working steadily at piecing star blocks into tops. 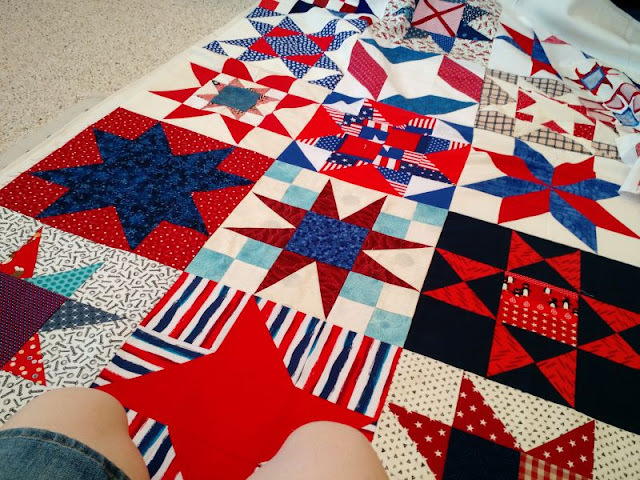 The stars block drive just wrapped up but the new one for Sept/Oct is going now if you want to participate! CiL has recently received donations from several companies and I will be thanking each one individually here as the Fall goes on. The fabrics below came from StudioE, Henry Glass, A E Nathan, and Blank Quilting (which I guess all have the same parent company). Just look at all those cuts! In the star top above the sashing and border (not pictured) were cut from these fabrics, plus the backing. Big thank you to those companies for supporting CiL; if you're in the market for fabric please consider supporting them with a purchase! Also big thank you to Nicki, who asked around cooperate donations.